Holi is the only festival that comes with jam-packed fun, colors, and everything that springs the beauty of it. And to add up to its vibrancy, these Holi gifts can simply add rejoice in the most scintillating manner. 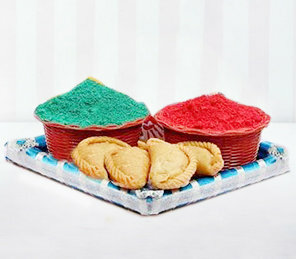 Full of enticing colors, striking beauty, each of the tokens can send Holi wishes in the utmost fervor. Don't wait further to send holi gifts for your friends and family. Celebrate the festival of colors with colorful product range from FlowerAura. We are giving FREE Gulaal from our side with every purchase from these listed products. Hurry up and start spreading festive colors around.